This great combo voucher scheme gives you amazing discounts to six of Lanzarote's top attractions – Timanfaya, la Cueva de los Verdes, Jameos del Agua, the Cactus Garden, Mirador del Rio and the Museum of Contemporary Art. It also provides you with a great opportunity to learn more about the work of local artist Cesar Manrique. Timanfaya, also known as the Mountains of Fire, is an eerie moonscape formed by massive volcanic eruptions between 1730 and 1736. 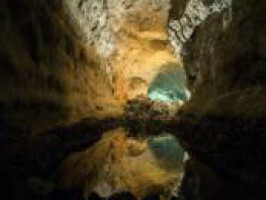 The Cueva de los Verdes and the Jameos del Agua are situated inside volcanic tunnels produced by the eruption of the Corona Volcano. Both cave systems have been specially prepared for visitors with amazing illumination systems and even s small theatre for concerts, designed by Manrique. 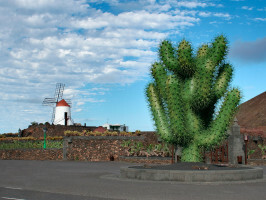 The Cactus Garden, also designed by Manrique is located in an old quarry and contains thousands of species of cacti from the Canary Islands and other parts of the world. 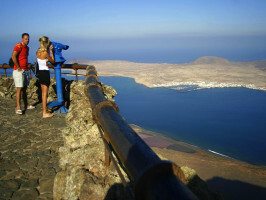 The Mirador del Rio is a viewpoint situated on 480m cliffs looking out over the straits separating Lanzarote from the neighbouring island of La Graciosa. The International Museum of Contemporary Art (MIAC), situated at the Castle of San Jose contains works by Miro, Millares, Mompó, Cárdena and Manrique. 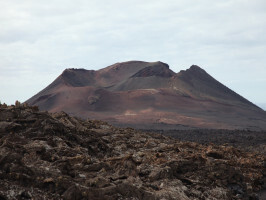 You can choose from the following combinations: Jewels of Lanzarote: Entrance to three attractions for the price of two. Choose two attractions from Jameos del Agua, Cueva de Los Verdes and Timanfaya and one from Cactus Garden and Mirador del Rio. 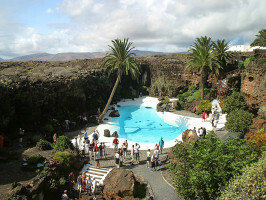 Entrance to four attractions: Jameos del Agua, Cueva de Los Verdes and Timanfaya and either Cactus Garden or Mirador del Rio. Entrance to all six attractions: Jameos del Agua, Cueva de Los Verdes, Timanfaya, Cactus Garden Mirador del Rio and MIAC. 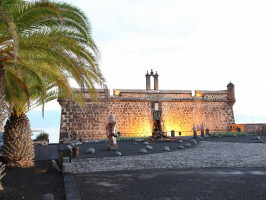 Meeting point :go to: Centros de Arte, Cultura y Turismo del Cabildo de Lanzarote (Jameos del Agua, Montañas del Fuego, Cueva de los Verdes, Jardin de Cactus, Mirador del Rio or MIAC.). This voucher is valid for 14 days and includes one entrance for each center .Once you get the entrance to the first Center please present this voucher. The people at the entrance will take this voucher and instead they will give you a ticket. You will have to present this ticket to any center you visit till you finished the 3 Touristic Centers.